Mohandas Karamchand Gandhi (Gujarati: મોહનદાસ કરમચંદ ગાંધી, Hindi: मोहनदास करमचंद गांधी, IAST: mohandās karamcand gāndhī, IPA: [moːhənd̪aːs kərəmtʃənd̪ gaːnd̪ʱiː]) (October 2, 1869 – January 30, 1948) was a major political and spiritual leader of the Indian independence movement. He was the pioneer of Satyagraha — resistance through mass civil disobedience strongly founded upon ahimsa (non-violence) becoming one of the strongest philosophies of freedom struggles worldwide. Gandhi is commonly known and spoken of worldwide as Mahatma Gandhi (Hindi: महात्मा, məhatma ; from Sanskrit, Mahatma: Great Soul) and is fondly called Bapu (in Gujarati, Father). Gandhi first employed his ideas of civil disobedience in the Indian struggle for civil rights in South Africa. Upon his return to India, Gandhi helped lead poor farmers and labourers to protest oppressive taxation and widespread discrimination. Leading the Indian National Congress, Gandhi worked for the alleviation of poverty, the liberation of women, brotherhood, end to untouchability and caste discrimination and for the economic self-sufficiency of the nation. However, Gandhi's work focused upon the goal of Swaraj — self-rule for India. Gandhi famously led Indians in the disobedience of the salt tax through the 400 kilometre (248 miles) Dandi March, and in an open call for the British to Quit India in 1942. However his goal, freedom, came at a heavy cost: tens of thousands died in all of his movements as they clashed with the British. Gandhi remained committed to non-violence and truth even in the most extreme situations. Gandhi was a student of Hindu philosophy and lived simply, organizing an ashram that was self-sufficient in its needs. He made his own clothes and lived on a simple vegetarian diet. He used rigorous fasts for self-purification as well as a means of protest. All this was mainly done to raise the status of India's depressed classes and draw them into the freedom struggle. Gandhi's teachings have inspired civil rights leaders such as Dr. Martin Luther King Jr., Steve Biko, Nelson Mandela and Aung San Suu Kyi. Gandhi is honoured as the Father of the Nation in India. His birthday on October 2nd is annually commemorated as Gandhi Jayanti, a national holiday. Mohandas Karamchand Gandhi was born into the Hindu Modh family in Porbandar, Gujarat, India, in 1869. He was the son of Karamchand Gandhi, the diwan (Prime Minister) of Porbandar, and Putlibai, Karamchand's fourth wife, a Hindu of the Pranami Vaishnava order. Karamchand's first two wives, who each bore him a daughter, died from unknown reasons (rumored to be in childbirth). His third wife was deemed incapacitated and gave her permission to Karamchand for him to marry again. Growing up with a devout mother and surrounded by the Jain influences of Gujarat, Gandhi learned from an early age the tenets of non-injury to living beings, vegetarianism, fasting for self-purification, and mutual tolerance between members of various creeds and sects. He was born into the vaishya, or business, caste. 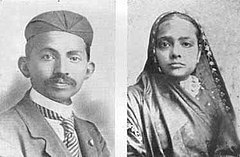 In May 1883, at the age of 13, Gandhi was married through his parents' arrangement to Kasturba Makhanji (also spelled "Kasturbai" or known as "Ba"), who was his age. They had four sons: Harilal Gandhi, born in 1888; Manilal Gandhi, born in 1892; Ramdas Gandhi, born in 1897; and Devdas Gandhi, born in 1900. Gandhi was a mediocre student in his youth at Porbandar and later Rajkot. 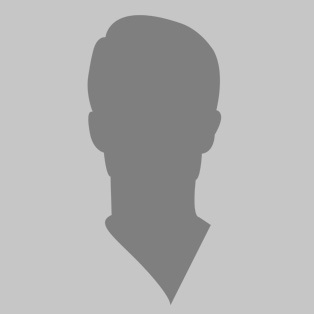 He barely passed the matriculation exam for Samaldas College at Bhavanagar, Gujarat. He was also unhappy at the college, because his family wanted him to become a barrister. At the age of 18 on September 4, 1888, Gandhi went to University College London to train as a barrister. His time in London, the Imperial capital, was influenced by a vow he had made to his mother in the presence of a Jain monk Becharji, upon leaving India, to observe the Hindu precepts of abstinence from meat, alcohol, and promiscuity. Although Gandhi experimented with adopting "English" customs – taking dancing lessons for example – he could not stomach his landlady's mutton and cabbage. She pointed him towards one of London's few vegetarian restaurants. Rather than simply go along with his mother's wishes, he read about, and intellectually embraced vegetarianism. He joined the Vegetarian Society, was elected to its executive committee, and founded a local chapter. He later credited this with giving him valuable experience in organizing institutions. Some of the vegetarians he met were members of the Theosophical Society, which had been founded in 1875 to further universal brotherhood, and devoted to the study of Buddhist and Hindu Brahmanistic literature. They encouraged Gandhi to read the Bhagavad Gita. Not having shown a particular interest in religion before, he read works of and about Hinduism, Christianity, Buddhism, Islam and other religions. He returned to India after being admitted to the bar of England and Wales, but had limited success establishing a law practice in Bombay, later applying and being turned down for a part-time job as a high school teacher. He ended up returning to Rajkot to make a modest living drafting petitions for litigants, but was forced to close down that business as well when he ran afoul of a British officer. In his autobiography, he describes this incident as a kind of unsuccessful lobbying attempt on behalf of his older brother. It was in this climate that (in 1893) he accepted a year-long contract from an Indian firm to a post in Natal, South Africa. Gandhi read his first newspaper at the age of 18, and was prone to stage fright while speaking in court. South Africa changed him dramatically, as he faced the discrimination commonly directed at blacks and Indians. One day in court at Durban, the magistrate asked him to remove his turban. Gandhi refused and stormed out of the courtroom. He was thrown off a train at Pietermaritzburg, after refusing to move from the first class to a third class coach while holding a valid first class ticket. Traveling further on by stagecoach, he was beaten by a driver for refusing to travel on the foot board to make room for a European passenger. He suffered other hardships on the journey as well, including being barred from many hotels. These incidents have been acknowledged by several biographers as a turning point in his life, for his activism later. It was through witnessing firsthand the racism, prejudice and injustice against Indians in South Africa that Gandhi started to question his people's status, and his own place in society. However, these events by no means explain why he inculcated non-violence instead of aggressive revolution. Gandhi in the uniform of a sergeant of the Indian Ambulance Corps. He served during the Boer War (1899). At the end of his contract, Gandhi prepared to return to India. However, at a farewell party in his honour in Durban, he happened to glance at a newspaper and learned that a bill was being considered by the Natal Legislative Assembly to deny the right to vote to Indians. When he brought this up with his hosts, they lamented that they did not have the expertise necessary to oppose the bill, and implored Gandhi to stay and help them. He circulated several petitions to both the Natal Legislature and the British Government in opposition to the bill. Though unable to halt the bill's passage, his campaign was successful in drawing attention to the grievances of Indians in South Africa. Supporters convinced him to remain in Durban to continue fighting against the injustices levied against Indians in South Africa. He founded the Natal Indian Congress in 1894, with himself as the Secretary. Through this organization, he molded the Indian community of South Africa into a homogeneous political force, publishing documents detailing Indian grievances and evidence of British discrimination in South Africa. Gandhi returned briefly to India in 1896 to bring his wife and children to live with him in South Africa. When he returned in January 1897, a white mob attacked and tried to lynch him. In an early indication of the personal values that would shape his later campaigns, he refused to press charges on any member of the mob, stating it was one of his principles not to seek redress for a personal wrong in a court of law. In 1913 he started a newspaper called the Indian Opinion. In May 1915, Gandhi founded an ashram on the outskirts of Ahmedabad, India and called it Satyagrah Ashram (also known as Sabarmati Ashram). There lodged twenty five men and women who took vows of truth, celibacy, ahimsa, nonpossession, control of the palate, and service of the Indian people. As he had done in the South African War, Gandhi urged support of the British in World War I and was active in encouraging Indians to join the army. His rationale, opposed by many others, was that if he desired the full citizenship, freedoms and rights in the Empire, it would be wrong not to help in its defence. He spoke at the conventions of the Indian National Congress, but was primarily introduced to Indian issues, politics and the Indian people by Gopal Krishna Gokhale, at the time one of the most respected leaders of the Congress Party. Gandhi in 1918, at the time of the Kheda and Champaran satyagrahas. Gandhi's first major achievements came in 1918 with the Champaran agitation and Kheda Satyagraha, although in the latter it was indigo and other cash crops instead of the food crops necessary for their survival. Suppressed by the militias of the landlords (mostly British), they were given measly compensation, leaving them mired in extreme poverty. The villages were kept extremely dirty and unhygienic; and alcoholism, untouchability and purdah were rampant. Now in the throes of a devastating famine, the British levied an oppressive tax which they insisted on increasing in rate. The situation was desperate. In Kheda in Gujarat, the problem was the same. Gandhi established an ashram there, organizing scores of his veteran supporters and fresh volunteers from the region. He organized a detailed study and survey of the villages, accounting the atrocities and terrible episodes of suffering, including the general state of degenerate living. Building on the confidence of villagers, he began leading the clean-up of villages, building of schools and hospitals and encouraging the village leadership to undo and condemn many social evils, as accounted above. But his main assault came as he was arrested by police on the charge of creating unrest and was ordered to leave the province. Hundreds of thousands of people protested and rallied outside the jail, police stations and courts demanding his release, which the court unwillingly granted. Gandhi led organized protests and strikes against the landlords, who with the guidance of the British government, signed an agreement granting more compensation and control over farming for the poor farmers of the region, and cancellation of revenue hikes and collection until the famine ended. It was during this agitation, that Gandhi was addressed by the people as Bapu (Father) and Mahatma (Great Soul). In Kheda, Patel represented the farmers in negotiations with the British, who suspended revenue collection and granted relief. All of the prisoners were released. Gandhi's resulting fame spread all over the nation. In Punjab, the Jallianwala Bagh massacre of civilians by British troops caused deep trauma to the nation, and increased public anger and acts of violence. Gandhi criticized both the actions of the British, and the retaliatory violence of Indians. He authored the resolution offering condolences to British civilian victims and condemning the riots, which after initial opposition in the party, was accepted after Gandhi made an emotional speech pushing forth his principle that all violence was evil and could not be justified. But it was after the massacre and violence that Gandhi's mind focused upon obtaining complete self-government and control of all Indian government institutions, maturing soon into Swaraj or complete individual, spiritual, political independence. Gandhi was invested with executive authority on behalf of the Indian National Congress in December 1921. Under Gandhi's leadership, the Congress was reorganized with a new constitution, with the goal of Swaraj. Membership in the party was opened to anyone prepared to pay a token fee. A hierarchy of committees was set up to improve discipline, transforming the party from an elite organization to one of mass national appeal. Gandhi expanded his non-violence platform to include the swadeshi policy – the boycott of foreign-made goods, especially British goods. Linked to this was his advocacy that khadi (homespun cloth) be worn by all Indians instead of British-made textiles. Gandhi exhorted Indian men and women, rich or poor, to spend time each day spinning khadi in support of the independence movement. This was a strategy to inculcate discipline and dedication to weed out the unwilling and ambitious, and include women in the movement at a time when many thought that such activities were not "respectable" for women. In addition to boycotting British products, Gandhi urged the people to boycott British educational institutions and law courts, to resign from government employment, and to forsake British titles and honours. "Non-cooperation" enjoyed wide-spread appeal and success, increasing excitement and participation from all strata of Indian society, yet just as the movement reached its apex, it ended abruptly as a result of a violent clash in the town of Chauri Chaura, Uttar Pradesh, in February 1922. Fearing that the movement was about to take a turn towards violence, and convinced that this would be the undoing of all his work, Gandhi called off the campaign of mass civil disobedience. Gandhi was arrested on March 10, 1922, tried for sedition, and sentenced to six years. Beginning on March 18, 1922, he only served about two years of the sentence, being released in February 1924 after an operation for appendicitis. Without Gandhi's uniting personality, the Indian National Congress began to splinter during his years in prison, splitting into two factions, one led by Chitta Ranjan Das and Motilal Nehru favouring party participation in the legislatures, and the other led by Chakravarti Rajagopalachari and Sardar Vallabhbhai Patel, opposing this move. Furthermore, cooperation among Hindus and Muslims, which had been strong at the height of the nonviolence campaign, was breaking down. Gandhi attempted to bridge these differences through many means, including a three-week fast in the autumn of 1924, but with limited success. Gandhi at a public rally during the Salt Satyagraha. Gandhi stayed out of the limelight for most of the 1920s, preferring to resolve the wedge between the Swaraj Party and the Indian National Congress, and expanding initiatives against untouchability, alcoholism, ignorance and poverty. He returned to the fore in 1928. The year before, the British government had appointed a new constitutional reform commission under Sir John Simon, numbering not a single Indian in its ranks. The result was a boycott of the commission by Indian political parties. Gandhi pushed through a resolution at the Calcutta Congress in December 1928 calling on the British government to grant India dominion status or face a new campaign of non-violence with complete independence for the country as its goal. Gandhi had moderated the views of younger men like Subhas Chandra Bose and Jawaharlal Nehru, who sought a demand for immediate independence, but also modified his own call to a one year wait, instead of two. The British did not respond. On December 31, 1929, the flag of India was unfurled in Lahore. January 26, 1930 was celebrated by the Indian National Congress, meeting in Lahore, as India's Independence Day. This day was commemorated by almost every other Indian organization. Making good on his word in March 1930, he launched a new satyagraha against the tax on salt, highlighted by the famous Salt March to Dandi from March 12 to April 6, 1930, marching 400 kilometres (248 miles) from Ahmedabad to Dandi, Gujarat to make his own salt. Thousands of Indians joined him on this march to the sea. This campaign was one of his most successful, resulting in the imprisonment of over 60,000 people. The government, represented by Lord Edward Irwin, decided to negotiate with Gandhi. The Gandhi-Irwin Pact was signed in March 1931. In it, the British Government agreed to set all political prisoners free in return for the suspension of the civil disobedience movement. Furthermore, Gandhi was invited to attend the Round Table Conference in London as the sole representative of the Indian National Congress. The conference was a disappointment to Gandhi and the nationalists, as it focused on the Indian princes and Indian minorities rather than the transfer of power. Furthermore, Lord Irwin's successor, Lord Willingdon, embarked on a new campaign of repression against the nationalists. Gandhi was again arrested, and the government attempted to destroy his influence by completely isolating him from his followers. This tactic was not successful. In 1932, through the campaigning of the Dalit leader B. R. Ambedkar, the government granted untouchables separate electorates under the new constitution. In protest, Gandhi embarked on a six-day fast in September 1932, successfully forcing the government to adopt a more equitable arrangement via negotiations mediated by the Dalit cricketer turned political leader Palwankar Baloo. This began a new campaign by Gandhi to improve the lives of the untouchables, whom he named Harijans, the children of God. On May 8, 1933 Gandhi began a 21-day fast of self-purification to help the Harijan movement. In the summer of 1934, three unsuccessful attempts were made on his life. When the Congress Party chose to contest elections and accept power under the Federation scheme, Gandhi decided to resign from party membership. He did not at all disagree with the party's move, but felt that if he resigned, his popularity with Indians would cease to stifle the party's membership, that actually varied from communists, socialists, trade unionists, students, religious conservatives, to those with pro-business convictions. Gandhi also did not want to prove a target for Raj propaganda by leading a party that had temporarily accepted political accommodation with the Raj. Gandhi returned to the head in 1936, with the Nehru presidency and the Lucknow session of the Congress. Although Gandhi desired a total focus on the task of winning independence and not speculation about India's future, he did not restrain the Congress from adopting socialism as its goal. Gandhi had a clash with Subhas Bose, who had been elected to the presidency in 1938. Gandhi's main issues with Bose were his lack of commitment to democracy, and lack of faith in non-violence. Bose won his second term despite Gandhi's criticism, but left the Congress when the All-India leaders resigned en masse in protest of his abandonment of principles introduced by Gandhi. Mahadev Desai (left) reading out a letter to Gandhi from the viceroy at Birla House, Mumbai, April 7, 1939. World War II broke out in 1939 when Nazi Germany invaded Poland. Initially, Gandhi had favored offering "non-violent moral support" to the British effort, but other Congress leaders were offended by the unilateral inclusion of India into the war, without consultation of the people's representatives. All Congressmen elected to office resigned en masse. After lengthy deliberations, Gandhi declared that India could not be party to a war ostensibly being fought for democratic freedom, while that freedom was denied in India herself. As the war progressed, Gandhi increased his demands for independence, drafting a resolution calling for the British to Quit India. This was Gandhi's and the Congress Party's most definitive revolt aimed at securing the British exit from Indian shores. Gandhi was criticized by some Congressmen and other Indian political groups, both pro-British and anti-British. Some felt that opposing Britain in its life-death struggle was immoral, and others felt that Gandhi wasn't doing enough. Quit India became the most forceful movement in the history of the struggle, with mass arrests and violence on an unprecedented scale. Thousands of freedom fighters were killed or injured by police gunfire, and hundreds of thousands were arrested. Gandhi and his supporters made it clear they would not support the war effort unless India was granted immediate independence. He even clarified that this time the movement would not be stopped if individual acts of violence were committed, saying that the "ordered anarchy" around him was "worse than real anarchy". He called on all Congressmen and Indians to maintain discipline in ahimsa, and Karo Ya Maro (Do or Die) in the cause of ultimate freedom. Gandhi and the entire Congress Working Committee were arrested in Bombay by the British on August 9, 1942. Gandhi was held for two years in the Aga Khan Palace in Pune. It was here that Gandhi suffered two terrible blows in his personal life — his 42 year old secretary Mahadev Desai died of a heart attack 6 days later, then his wife Kasturba died after 18 months imprisonment in February 1944 (six weeks later Gandhi suffered a severe malaria attack). He was released before the end of the war on May 6, 1944 because of his failing health and necessary surgery; the Raj did not want him to die in prison and enrage the nation. Although Quit India somewhat succeeded in its objective, the ruthless suppression of the movement brought order to India by the end of 1943. At the end of the war, the British gave clear indications that power would be transferred to Indian hands, and Gandhi called off the struggle, and the Congress leadership and around 100,000 political prisoners were released. Gandhi advised the Congress to reject the proposals the British Cabinet Mission offered in 1946, as he was deeply suspicious of the grouping proposed for Muslim-majority states — Gandhi viewed this as a precursor to partition. However, this became one of the few times the Congress broke from Gandhi's advice (though not his leadership), as Nehru and Patel knew that if the Congress did not approve the plan, the control of government would pass to the Muslim League. Between 1946 and 1947, over 5,000 people were killed in violence. Gandhi was vehemently opposed to any plan that partitioned India into two separate countries. An overwhelming majority of Muslims living in India, side by side with Hindus and Sikhs, were in favour of Partition. Additionally Muhammad Ali Jinnah, the leader of the Muslim League, commanded widespread support in West Punjab, Sindh, NWFP and East Bengal. The partition plan was approved by the Congress leadership as the only way to prevent a wide-scale Hindu-Muslim civil war. Congress leaders knew that Gandhi would viscerally oppose partition, and it was impossible for the Congress to go ahead without his agreement, for Gandhi's support in the party and throughout India was strong. Gandhi's closest colleagues had accepted partition as the best way out, and Sardar Patel endeavoured to convince Gandhi that it was the only way to avoid civil war. A devastated Gandhi gave his assent. On the day of the transfer of power, Gandhi did not celebrate independence with the rest of India, but was alone in Calcutta, mourning the partition and working to end the violence. After India's independence, Gandhi focused on Hindu-Muslim peace and unity. He conducted extensive dialogue with Muslim and Hindu community leaders, working to cool passions in northern India, as well as in Bengal. Despite the Indo-Pakistani War of 1947, he was troubled when the Government decided to deny Pakistan the Rs. 55 crores due as per agreements made by the Partition Council. Leaders like Sardar Patel feared that Pakistan would use the money to bankroll the war against India. Gandhi was also devastated when demands resurged for all Muslims to be deported to Pakistan, and when Muslim and Hindu leaders expressed frustration and an inability to come to terms with one another. He launched his last fast-unto-death in Delhi, asking that all communal violence be ended once and for all, and that the payment of Rs. 55 crores be made to Pakistan. Gandhi feared that instability and insecurity in Pakistan would increase their anger against India, and violence would spread across the borders. He further feared that Hindus and Muslims would renew their enmity and precipitate into an open civil war. After emotional debates with his life-long colleagues, Gandhi refused to budge, and the Government rescinded its policy and made the payment to Pakistan. Hindu, Muslim and Sikh community leaders, including the Rashtriya Swayamsevak Sangh and Hindu Mahasabha assured him that they would renounce violence and call for peace. Gandhi thus broke his fast by sipping orange juice. Raj Ghat: Gandhi's Memorial in Delhi. According to his wish, The majority of Gandhi's ashes were immersed in all the major rivers of the world such as The Nile, Volga, Thames, etc. Also, a small portion was sent to Paramahansa Yogananda from Dr. V.M. Nawle, (a publisher and journalist from Poona, India) encased in a brass & silver coffer. The ashes were then enshrined at the Mahatma Gandhi World Peace Memorial in the Self-Realization Fellowship Lake Shrine within a thousand-year-old stone sarcophagus from China. Gandhi stated that the most important battle to fight was overcoming his own demons, fears, and insecurities. Gandhi summarized his beliefs first when he said "God is Truth." He would later change this statement to "Truth is God." Thus, Satya (Truth) in Gandhi's philosophy is "God". "I would like you to lay down the arms you have as being useless for saving you or humanity. You will invite Herr Hitler and Signor Mussolini to take what they want of the countries you call your possessions.... If these gentlemen choose to occupy your homes, you will vacate them. If they do not give you free passage out, you will allow yourselves, man, woman, and child, to be slaughtered, but you will refuse to owe allegiance to them." . As a young child, Gandhi experimented in meat-eating. This was due partially to his inherent curiosity as well as his rather persuasive peer and friend Sheikh Mehtab. The idea of vegetarianism is deeply engrained in Hindu and Jain traditions in India, and, in his native land of Gujarat, many Hindus were vegetarian. The Gandhi family was no exception. Before leaving for his studies in London, Gandhi made a promise to his mother, Putlibai and his uncle, Becharji Swami that he would abstain from eating meat, taking alcohol, and engaging in promiscuity. He held fast to his promise and gained more than a diet, he gained a basis for his life-long philosophies. As Gandhi grew into adulthood, he became a strict vegetarian, though he was not against the consumption of eggs. He wrote articles on the subject, some of which were published in the London Vegetarian Society's publication: "The Vegetarian." Gandhi inspired many people around the world to become vegetarian. Gandhi, himself, became inspired by many great minds during this period and befriended a chairman of the London Vegetarian Society, Dr. Josiah Oldfield. Having also read and admired the work of Henry Stephens Salt, the young Mohandas met and often corresponded with the vegetarian campaigner. Gandhi spent much time advocating vegetarianism during and after his time in London. To Gandhi, a vegetarian diet would not only satisfy the requirements of the body, it would also serve an economic purpose as meat was, and still is, generally more expensive than grains, vegetables, and fruits. Also, many Indians of the time struggled with low income, thus vegetarianism was seen not only as a spiritual practice but also a practical one. He abstained from eating for long periods, using fasting as a form of political protest. He refused to eat until his death or his demands were met. It was noted in his autobiography that vegetarianism was the beginning of his deep commitment to Brahmacharya; without total control of the palate his success in Bramacharya would have been likely to falter. This decision was deeply influenced by the philosophy of Brahmacharya—spiritual and practical purity—largely associated with celibacy and asceticism. Gandhi saw brahmacharya as a means of going close to God and as a primary foundation for self realization. In his autobiography he tells of his battle against lustful urges and fits of jealousy with his childhood bride, Kasturba. He felt it his personal obligation to remain celibate so that he could learn to love, rather than lust. For Gandhi brahmacharya meant control of the senses in thought, word and deed. Gandhi earnestly believed that a person involved in social service should lead a simple life which he thought could lead to Brahmacharya. His simplicity began by renouncing the western lifestyle he was leading in South Africa. He called it "reducing himself to zero", which entailed giving up unnecessary expenditure, embracing a simple lifestyle and washing his own clothes. On one occasion he returned the gifts bestowed to him from the natals for his diligent service to the community. Gandhi spent one day of each week in silence. He believed that abstaining from speaking brought him inner peace. This influence was drawn from the Hindu principles of mouna (silence) and shanti (peace). On such days he communicated with others by writing on paper. For three and a half years, from the age of 37, Gandhi refused to read newspapers, claiming that the tumultuous state of world affairs caused him more confusion than his own inner unrest. Returning to India from South Africa, where he had enjoyed a successful legal practice, he gave up wearing Western-style clothing, which he associated with wealth and success. He dressed to be accepted by the poorest person in India, advocating the use of homespun cloth (khadi). Gandhi and his followers adopted the practice of weaving their own clothes from thread they themselves spun, and encouraged others to do so. While Indian workers were often idle due to unemployment, they had often bought their clothing from industrial manufacturers owned by British interests. It was Gandhi's view that if Indians made their own clothes, it would deal an economic blow to the British establishment in India. Consequently, the spinning wheel was later incorporated into the flag of the Indian National Congress. He would wear a dhoti all his life to show simplicity. "Hinduism as I know it entirely satisfies my soul, fills my whole being ... When doubts haunt me, when disappointments stare me in the face, and when I see not one ray of light on the horizon, I turn to the Bhagavad Gita, and find a verse to comfort me; and I immediately begin to smile in the midst of overwhelming sorrow. My life has been full of tragedies and if they have not left any visible and indelible effect on me, I owe it to the teachings of the Bhagavad Gita." "The sayings of Muhammad are a treasure of wisdom, not only for Muslims but for all of mankind." "Yes I am. I am also a Christian, a Muslim, a Buddhist and a Jew." In spite of their deep reverence to each other, Gandhi and Rabindranath Tagore got involved in protracted debates more than once. These debates exemplify the philosophical differences between the two most famous Indians at the time. On January 15, 1934, an earthquake hit Bihar and caused extensive damage and loss of life. Gandhi maintained this was because of the sin committed by upper caste Hindus by not letting untouchables in their temples (Gandhi was committed to the cause of improving the fate of untouchables, referring to them as Harijans, people of Krishna). Tagore vehemently opposed Gandhi's stance, maintaining that an earthquake can only be caused by natural forces, not moral reasons, however repugnant the practice of untouchability may be. Statue of Mahatma Gandhi in Tavistock Square Gardens, London. Gandhi's birthday, 2 October is a national holiday, Gandhi Jayanti. The word Mahatma, while often mistaken for Gandhi's given name in the West, is taken from the Sanskrit words maha meaning Great and atma meaning Soul. Most sources, such as Dutta and Robinson's Rabindranath Tagore: An Anthology, state that Rabindranath Tagore first accorded the title of Mahatma to Gandhi. Other sources state that Nautamlal Bhagavanji Mehta accorded him this title on January 21, 1915. In his autobiography, Gandhi nevertheless explains that he never felt worthy of the honour. According to the manpatra, the name Mahatma was given in response to Gandhi's admirable sacrifice in manifesting justice and truth. Time Magazine named Gandhi the Man of the Year in 1930, the runner-up to Albert Einstein as "Person of the Century" at the end of 1999, and named The Dalai Lama, Lech Wałęsa, Dr. Martin Luther King, Jr., Cesar Chavez, Aung San Suu Kyi, Benigno Aquino Jr., Desmond Tutu, and Nelson Mandela as Children of Gandhi and his spiritual heirs to non-violence. The Government of India awards the annual Mahatma Gandhi Peace Prize to distinguished social workers, world leaders and citizens. Nelson Mandela, the leader of South Africa's struggle to eradicate racial discrimination and segregation, is a prominent non-Indian recipient. In 1996, the Government of India introduced the Mahatma Gandhi series of currency notes in rupees 5, 10, 20, 50, 100, 500 and 1000 denomination. Today, all the currency notes in circulation in India contain a portrait of Mahatma Gandhi. In 1969, the United Kingdom issued a series of stamps commemorating the centenary of Mahatma Gandhi. The centennial commemorative statue of Mahatma Gandhi in the center of downtown Pietermaritzburg, South Africa. In the United Kingdom, there are several prominent statues of Gandhi, most notably in Tavistock Square, London (near University College London), where he studied law. January 30 is commemorated in the United Kingdom as the "National Gandhi Remembrance Day." In the United States, there are statues of Gandhi outside the Union Square Park in New York City and the Martin Luther King, Jr. National Historic Site in Atlanta, and in Waikiki, Hawaii. The city of Pietermaritzburg, South Africa, where Gandhi was ejected in 1893 from a first-class train, now hosts a commemorative statue. There are wax statues of Gandhi at the Madame Tussaud's wax museums in New York and London, and other cities around the world. Gandhi never received the Nobel Peace Prize, though he was nominated five times between 1937 and 1948. Decades later, the Nobel Committee publicly declared its regret for the omission, and admitted to deeply divided nationalistic opinion denying the award. Mahatma Gandhi was to receive the Prize in 1948, but his assassination prevented the award from coming to him. The war breaking out between the newly created states of India and Pakistan could have been a complicating factor for Mahatma Gandhi not being presented with the Prize in 1948. The Prize was not awarded in 1948, the year of Gandhi's death, on the grounds that "there was no suitable living candidate" that year, and when the Dalai Lama was awarded the Prize in 1989, the chairman of the committee said that this was "in part a tribute to the memory of Mahatma Gandhi". The Committee felt so terrible it had not conferred the prize on Mahatma Gandhi that it kept looking at "other Indians" over the years. Those considered over the years were Jawaharlal Nehru and Vinoba Bhave. Mahatma Gandhi has been portrayed in film, literature, and in the theater. Ben Kingsley portrayed Gandhi in the 1982 award-winning film, Gandhi. Gandhi is also a central figure in the 2006 Bollywood film Lage Raho Munna Bhai. The philosophy of Gandhism is an important thematic component of both the 2005 film, Water and the novel by author Bapsi Sidhwa based on the film, also called Water (Gandhi also appears as a character in both). The Making of the Mahatma documents Gandhi's 21 years in South Africa. The play Mahatma vs. Gandhi explores his troubled relationship with his eldest son Harilal Gandhi. A 2002 play Mohandas Karamchand Gandhi (play) gives the life story of Gandhi from the age of twelve until his death. The opera Satyāgraha, composed by Philip Glass (in 1980), with a libretto by himself and Constance De Jong is based on the life of Gandhi. Dalit leader B. R. Ambedkar condemned Gandhi's terming the untouchable community as Harijans. This term meant "God's Children"; it implied that Dalits were socially immature, and that privileged caste Indians played a paternalistic role. Ambedkar and his allies also felt Gandhi was undermining Dalit political rights. Gandhi, although born into the vaishya caste, insisted that he was able to speak on behalf of Dalits, despite the availability of Dalit activists such as Ambedkar. Muhammad Ali Jinnah and contemporary Pakistanis condemned Gandhi for undermining Muslim political rights. Vinayak Damodar Savarkar and his allies condemned Gandhi, accusing him of politically appeasing Muslims while turning a blind eye to their atrocities against Hindus, and for allowing the creation of Pakistan (despite having publically declared that "before partitioning India, my body will have to be cut into two pieces"). Savarkar himself was tried for conspiracy in the Gandhi Murder case, as he was the mentor of the assassin Nathuram Godse and an important Hindu Mahasabha leader. However, he was acquitted following lack of any evidence of his involvement. In contemporary times, Marxist academicians like Ayesha Jalal blame Gandhi and the Congress for being unwilling to share power with Muslims and thus hastening partition. Hindu political activists like Pravin Togadia and Narendra Modi have been known to criticize Gandhi's leadership and actions. Gandhi also came under some political fire for his intolerance to those who attempted to achieve independence through more violent means. His refusal to protest against the hanging of Bhagat Singh, Sukhdev, Udham Singh and Rajguru were sources of condemnation throughout some parties within India. Economists, such as Jagdish Bhagwati, have criticized Gandhi's ideas of swadeshi. Gandhi also came under attack for his article, "Zionism and Anti-Semitism". He responded with three articles (see, Homer Jack, ed., The Gandhi Reader: A Sourcebook of His Life and Writings.) According to Jack, Gandhi felt a kinship with the Jewish community, but was against the partition of Palestine into two countries (in the same way he was against the division of India into two countries): "Gandhi had some close Jewish friends, especially in South Africa. There three of his closest Western co-workers were of Jewish ancestry...with the rise of Hitler and anti-Semitism in Germany, Gandhi felt compelled to denounce this aspect of racism, which he felt was akin to the kind of religious and racial discrimination he had fought all his life. He did not, however, regard Zionism as the right answer to the Jewish problem. In his article, "Zionism and Anti-Semitism," Gandhi writes: "If I were a Jew and were born in Germany and earned my livelihood there, I would claim Germany as my home even as the tallest Gentile German might, and challenge him to shoot me or cast me in the dungeon; I would refuse to be expelled or to submit to discriminating treatment." Gandhi was criticized for this article and responded in the article "Questions on the Jews, "Friends have sent me two newspaper cuttings criticizing my appeal to the Jews. The two critics suggest that in presenting non-violence to the Jews as a remedy against the wrong done to them, I have suggested nothing new....what I have pleaded for is renunciation of violence of the heart and consequent active exercise of the force generated by the great renunciation." He discusses this issue further in "Reply to Jewish Friends" and "Jews and Palestine." Dutta, Krishna and Andrew Robinson. Rabindranath Tagore: An Anthology, 1997, London: Picador/Macmillan. ISBN 0-330-34962-7. ^ M.K. Gandhi: An Autobiography. Retrieved 21 March 2006. ^ Documentation of how and when Mohandas K. Gandhi became known as the "Mahatma". Retrieved 21 March 2006. ^ "The life and death of Mahatma Gandhi", on BBC News , see section "Independence and partition"
^ Gandhi - 'Mahatma' or Flawed Genius? ^ "Several programmes mark Gandhi Jayanti celebrations in Mysore", hindu.com. Retrieved on 2006-11-16.